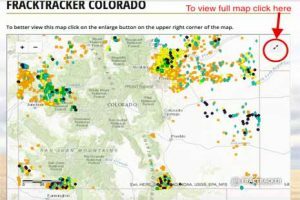 WORC’s newest digital resource, the WORC Oil and Gas Waste Mapping Project, maps the oil and gas waste stream in four Western states: Colorado, Montana, North Dakota, and Wyoming. The project is a visual follow-up to WORC report, No Time to Waste. Released in 2015, No Time to Waste detailed the regulatory shortcomings regarding the handling, disposal, and transportation of oil and gas waste. You can view the maps for each state by clicking the links below. To better view the maps, click on the enlarge button in the upper right corner of the maps. To provide people with a user-friendly resource that allows people to see the size and scale of the environmental impact of the oil and gas waste stream. This is to increase awareness of this pressing environmental issue. Create a resource that allows people to easily locate oil and gas waste near where they live. By making it easier for people to find oil and gas waste like spills, injections, or facilities near where they live, the project allows to communities to more easily monitor what is going on near where they live.